The first types of small modular telephone connectors were created by AT&T in the mid-1960s for the plug-in handset and line cords of the Trimline telephone. Driven by demand for multiple sets in residences with various lengths of cords, the Bell System introduced customer-connectable part kits and telephones, sold through PhoneCenter stores in the early 1970s. For this purpose, Illinois Bell started installing modular telephone sets on a limited scale in June 1972. The patents by Edwin C. Hardesty and coworkers, ‹See Tfd›US 3699498 (1972) and ‹See Tfd›US 3860316 (1975), followed by other improvements, were the basis for the modular molded-plastic connectors that became commonplace for telephone cords by the 1980s. 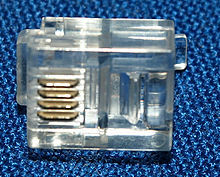 In 1976, these connectors were standardized nationally in the United States by the Registration Interface program of the Federal Communication Commission (FCC), which designated a series of Registered Jack (RJ) specifications for interconnection of customer-premises equipment to the public switched telephone network (PSTN). This page was last edited on 22 April 2019, at 14:48 (UTC).